"Mad Men" Review: "The Strategy" (Season 7 Episode 6) - "Did you park your white horse outside?" The seventh and final season of Mad Men continued with its sixth episode, “The Strategy,” last week, and I was unfortunately unable to review the episode due to some family commitments on Sunday night. So before publishing my thoughts on the season finale, which just finished airing, I thought I'd put up this brief analysis of the hour for your reading pleasure. As always, this review contains spoilers, and in an hour or two, I will be back with a full review/analysis of the season finale, “Waterloo.” See you then. Being unable to review this episode last week was a real shame, because “The Strategy,” while hardly the flashiest or most eventful episode of the season, was probably the best – and easily the most emotionally stirring – hour of the year so far. It was a positively intoxicating piece of writing – I wanted to write every last line of dialogue down in my notes, so beautiful was each and every one of them – and even rectified my one major problem with the season. I felt the focus had been relatively narrow all year, keeping the attention on Don and his arc without significant time spent on the rest of the cast, but “The Strategy” shone a spotlight on several supporting cast members – this was the year’s best episode so far for Peggy, Joan, and Pete, and we got very effective appearances from guest characters like Bob Benson and Trudy – and in a way that tied many of the major themes of the season together, making this feel like a more communal journey for the cast. The metaphor of the initial Burger Chef pitch was obvious: Sublimating the guilt of fast food to make it feel like a “treat,” turning familial discomfort into smiles, just as the agency is, at this point, a collection of people feigning happiness in their professional and personal lives (Pete being the most obvious example). But it was an allegory that propelled so much emotionally rich tension between the characters over the course of the episode, as everybody was forced to strip away the veneer of their existing relationships and look at the pain, confusion, or anxiety they are sublimating. Pete tries to reclaim a happy family life with his daughter, only to find that Tammy doesn’t even recognize him. Bob proposes to Joan as a way to give both of them a boost in social standing – giving Bob ‘respectability’ among his executive peers (and a ‘beard’ of sorts, if Bob is gay), and Joan a chance at a more materially rich life – but Joan doesn’t want to live a lie (again, considering what she went through with her first husband), and cannot pretend she doesn’t want something real (Christina Hendricks killed that scene so hard, it nearly brought me to tears). Megan has largely given up on trying to live a bicoastal marriage with Don, and while she wears a happy face, her decision to move all her belongings back to L.A. tells Don, more directly than ever before, that this marriage is dead. And most importantly, Peggy simply can’t keep pretending to be happy and civil with Don in the office. He has screwed her over too much at this point, and once she starts being honest about her anger with him, and Don feels humbled enough by circumstances with Megan to finally listen, Don and Peggy are finally able to see the heart of their relationship again – and luckily, it is a friendship worth salvaging, as both characters realize when they start focusing on the work and see how much the other has to offer. Don inviting Peggy for a slow dance to Sinatra’s “My Way” is one of the great scenes in the history of this great series, satisfying not only because it represents a moment of healing between the show’s two most important characters, but because it is the single most significant moment of character growth Don has had all season. For one of the first times in perhaps his entire life, Don has real, genuine empathy for another human being, realizing, with the assistance of such a poignant song playing in the background, that Peggy’s pain and Peggy’s struggles are worth more than his – and that recognition of the inherent worth of others, including those he should, ostensibly, love, is the biggest step Don needs to take if he wants to become whole again. For the second time in one episode, I was nearly crying. Fantastic episode. Beautiful episode. Wonderful writing and performances. 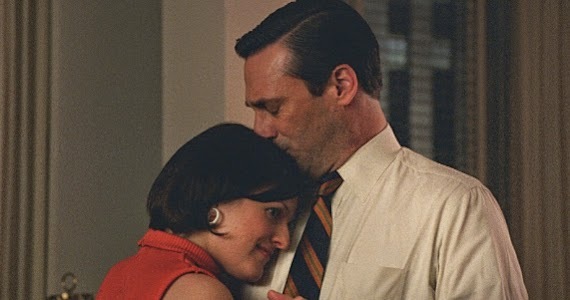 “The Strategy” was everything I want out of Mad Men and more, and took a big step towards making Season 7 feel like an emotionally and thematically cohesive whole. I couldn’t possibly ask for more. Thanks, Jonathan, I'm glad you're back.